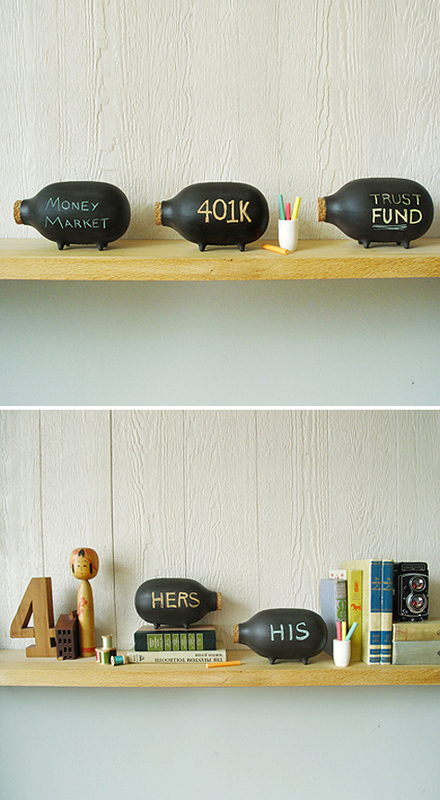 Ceramic piggy bank + chalk = awesome. Chalk-It-To-Me Piggy by Ladies & Gentlemen Studio - love the cork nose! My piggy bank would currently read "new camera." These are so awesome I want one even though I semi-loathe the sound of writing on a chalkboard. it will be a minor amount of short strokes - plus it's adorable :) worth the semi-torture! Great idea indeed....shame it's been done before and arguably done much better. I saw the 'CapitaList Pig' from 'Luckies' at a UK trade show years ago annnnnnnd they exhibited at the New York International Gift Fair this year where 'Ladies and Gentlemen'where also exhibiting.....strange coincidence?? I think not.